The private air carrier needs Rs 850 crore to help recover its debt. New Delhi: Jet Airways India Ltd., once India’s second-biggest airline, is flying just about a third of its fleet because its inability to pay lessors is grounding aircraft. The number may drop further, the nation’s airline regulator said. The company has 41 planes available, according to a statement released by the Directorate General of Civil Aviation after it reviewed Jet Air’s performance in New Delhi Tuesday. The beleaguered airline, which has a fleet of 119 as per its website, has been forced to ground planes as it awaits restructuring of its debt. The regulator’s review comes on a day the company missed a bond payment, and saw a flurry of speculation about its fate. Reports included India’s government asking banks to bailout the company, to Etihad Airways PJSC, which owns 24 percent in the Indian carrier, offering to sell its stake to lenders at 150 rupees apiece. 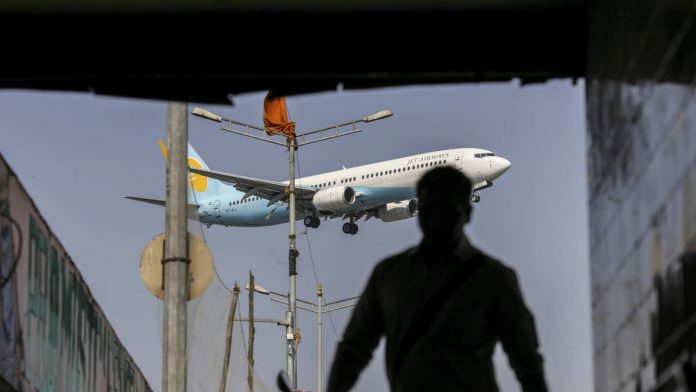 Jet Airways, which needs 85 billion rupees ($1.2 billion) to help it recover, is seeking a revival with banks becoming the biggest shareholders of the company, it said last month. Collapse of the airline could put about 23,000 jobs at stake and dent Prime Minister Narendra Modi’s image ahead of his re-election bid. Mumbai-based Jet Airways’ collapse will also damage his business-friendly image and will push up airfares. Jet missed a bond interest payment due on Tuesday, “owing to temporary liquidity constraints,” the company said in an exchange filing on Monday. The airline’s shares dropped 3.2 percent to 229.25 rupees on Tuesday.